Depending on your goals, Dodger Stadium is either a boom or a bust from a beer perspective. If you are looking to alter your experience through the use of a society-approved liquid drug, then the stadium is ready to provide. Their prices and sizes are very pocket-friendly: you can get a 24-ounce ‘tall boy’ domestic draft beer for $10.25, which is better value than most stadiums provide. These are large beers for a good price. If your aim is to drink the best-tasting beer that you might want to drink while facing the pitch, well then Chavez Ravine might have the worst beer selection in the bigs. Any review assumes a position of authority, and all this author can say is that he’s soiffed a lot of mash-based bubbling alcoholic drinks and that his basic stance is craft-leaning. The basic tenets if Big Beer are easy to spot: Velocity and Mass Appeal. The basic tenets of craft beer are Uniqueness and Boldness. If you pick the side that desires unique, bold tastes, you’ll want craft beers at your ballpark. I found few craft beers at the stadium in downtown Los Angeles. You can’t count Shocktop or Blue Moon — they might be better than your traditional Coors Lights, but they are owned by the same company and therefore suffer from the save time- and cost-saving corner-cutting tactics as the other beers brewed by their company. 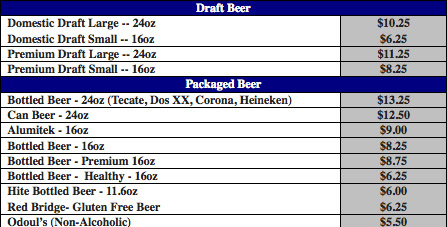 The “Premium Beer” huts at Dodger Stadium boast Dos Equis and Hite. Foreign Big Beer does not usually count as craft, even if it might be a step above the “Alumitek” Bud Light cans that sat right next to them on the counter. You can pay extra to get into the Prime Ticket Club but then the best beers you’ll add to the list are two InBev global specials on tap: Stella Artois and Heineken. To recap: so far we have a choice between Budweiser, Hefe Budweiser, Korean Budweiser Dutch Budweiser and Mexican Budweiser. In a simpler time, that might suffice.